I’ll admit I find drinking plain old water boring sometimes. Unless I’m super parched, but even then it’s fun to spice things up. Staying hydrated is important for healthy skin, digestion and healthy energy levels. Being dehydrated can cause headaches and fatigue. Drink up! Instead of drinking just water, brew iced tea. If you have an iced tea maker, add fresh chopped mint leaves to the machine, tea bags of your liking and brew. 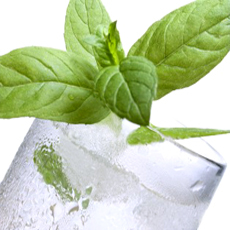 Mint adds a nice flavor and makes drinking water taste extra refreshing. Try adding a teaspoon of apple cider vinegar to water (about 8 to 10 oz). Apple cider vinegar has long been known as a health food and is good for quenching thirst. You can’t go wrong with citrus. Lemons, limes, oranges are great additions. Even add raspberries and kiwi slices. Letting the fruit soak in the water for a couple of hours will allow the flavors to infuse. Fill a pitcher with water and ice, followed by your choice of fruits and chill in the refrigerator for about an hour before enjoying.